Her love for the natural beauty of Armenia leaves a lasting impression on those she guides. She started out as a cultural tour guide but moved towards hiking and trekking after receiving the necessary training to follow her passion. If you are looking for someone fun and knowledgeable to show you the way then contact Karine! Karine is fantastic! As well as having great knowledge of the country, she provides delightful insight into the daily life in Armenia with a great sense of humour. 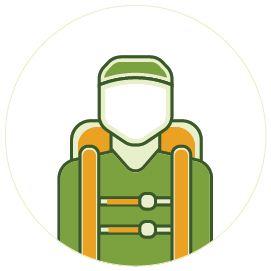 A trustworthy and skilled hiker to be alongside when trekking the beautiful country. Karine is a very friendly and knowledgeable hiker. She is very accommodating to all requests whether for a one day or longer excursion. Her knowledge of Armenia's rich history and folklore made the hiking experience that more enjoyable. To all my Adirondack and Pacific Cresters out there, Karine is the real deal. You will be most pleased with her abilities. - Andy D.
Karine is an exceptionally knowledgeable, professional and dedicated guide. She knows all the corners and interesting places in Armenia and loves to show them to the hikers. She is a great story teller and she makes sure that her guests enjoy the best of Armenia. It's a pleasure to discover Armenia's nature with Karine! When i came back to Armenia she took me to the mountains where I discovered a second Armenia to fall in love with. She impressed me with her passion towards her job and the nature around.